Mount Notre Dame is home to the Sisters of Notre Dame de Namur Province Center. It is located at 699 & 701 E. Columbia Avenue, Cincinnati, OH 45215-3999. 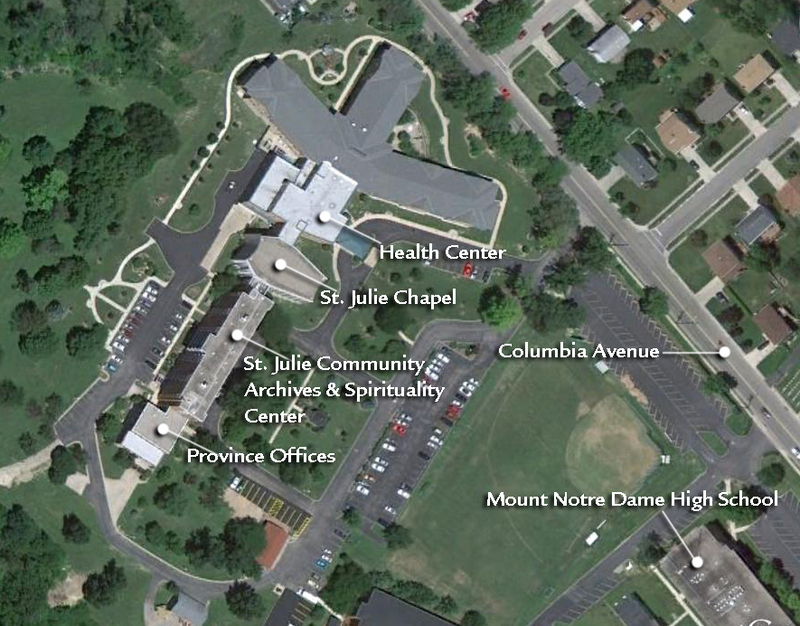 The Mount Notre Dame campus includes the Health Center, St. Julie Chapel, St. Julie Community, Spirituality Center, Archives and Province Offices. Daily Mass is offered Monday through Friday. Mass begins at 9:00 a.m. in the St. Julie Chapel and is open to the public. Take the Galbraith Road exit and turn LEFT. Follow Galbraith Road, then go EAST on Ronald Reagan Cross County Highway. Take the Ridge Road exit and turn LEFT. **Ridge Road becomes Columbia Avenue. Follow Columbia Avenue past Reading High School and Mount Notre Dame High School and turn LEFT into 699/701 E. Columbia Avenue. Parking is straight ahead. Go EAST on Ronald Reagan Cross County Highway. Take the Ridge Road exit and turn LEFT. Go WEST on Ronald Reagan Cross County Highway. Take the Ridge Road exit and turn RIGHT. A map of Mount Notre Dame and the surrounding area is available here. Front Entrance of Mount Notre Dame Health Center.